The following is a guest blog post by Jessica N. Asfour, Esq. of Asfour Law Office in Oakland, CA. Experts say that to begin your own law practice, you need only your own motivation and a mailing address. As an attorney with a new solo practice, I would like to unpack the last part of that statement: the mailing address. Private attorneys cannot use a post office box on most court filings (unless doing pro bono work for a legal services organization). This leaves you with the following options: use your home address, find a private office, sublease an office in a space with other professionals, or use a virtual office. Using your home address. Personal safety can be an issue. Your home address will be on all court filings and your business license. All your clients, the opposition, and the general public will know where you live. If you rent, using this address might be prohibited by your lease. My lease specifically prohibits me from using my apartment as a business address and my application for a business permit required me to submit another form, which would be sent to my landlord, if I used my home address. Check your lease carefully; you do not want to begin your law practice with your own breach of contract case. Would you be comfortable working and living in the same space? When I was considering working from home, my husband looked around our apartment and said despairingly, “does that mean you’ll have files everywhere?” Think of your clients’ comfort level too — will they want to meet in your home? If you plan to solve this by meeting at a coffee shop, how will you handle confidentiality issues? Finding a private office. I decided to get a private office because I found a location on Craigslist that was a perfect fit for me. Offices are usually priced by the square foot and vary widely depending on the location. Figure out the smallest space you need and go from there. Don’t forget about other costs like business insurance, furniture and internet. Think carefully about the location. Is it easily accessible for clients? Is it safe? How close is it to the law library so that you don’t have to purchase expensive books and databases? Don’t underestimate the value of independence. I found a space and put my name on the door. I can bring my dog to work and do not have to deal with issues from fellow space holders. This is ideal for me, but not everyone enjoys a lot of alone time. Subleasing an office. Subleasing with other attorneys could, depending on the relationships you work to develop, lead to support and advice from other attorneys and use of their equipment and libraries. Virtual office. A virtual office combines the benefits and detriments of working at home and in a private office. Virtual offices provide a mailing address for a monthly fee and other services such as mail forwarding, office and conference room rental, and office services. But beware, these services are priced separately and could lead to substantially higher costs than a monthy rental. You’ll also have to find daily work space, so consider all the issues discussed above on using your home address. CEB is ready to help lawyers in their first 5 years of practice with a free year of Onlaw, with over 140 CEB titles online. CEB also offers new lawyer discounts on programs and books. For an excellent program on starting your practice, including details on setting up an office, check out Launching a Successful Law Practice, available On Demand. 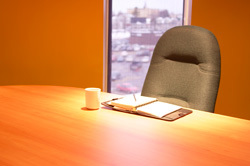 Check out our related blog post: Should You Go Solo? Julie, thanks for another informative post on the CEB blog. Don’t be afraid to shop around. I looked at four other locations and made numerous other inquiries before I found the perfect location: an office near our State Capitol with three other experienced attorneys in the same area of law. The price and amenities are very reasonable. Good luck!